Academic Regalia (cap and gown, etc.) - All degree candidates participating in a Commencement ceremony will be attired in the appropriate academic regalia (cap and gown) according to the degree being granted. Shoes: Consider heel heights as you select your shoes for the day. You will find that you are doing a lot of walking and/or standing throughout the day; so choose wisely. University Store - GRADUATION - This link takes you to the University Store Graduation page. The University Store updates that page annually in February. If you miss the Grad Fair or are unable to attend, you can order regalia online at that University Store site. Check that site for stated deadlines. Questions - Please contact the University Store. Convocation is a celebration and we know that you will want to dress for the occasion. Please consider that when you are on the stage, audience members will be below you and looking up. 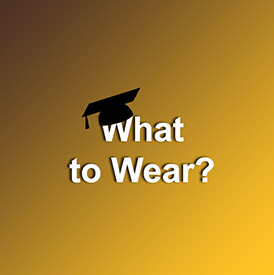 Be mindful of any exposed skin and of your posture when choosing your graduation outfit. Academic Regalia (cap and gown, etc.) is not worn at this ceremony. Wear nice, modest attire. No shorts/jeans. Be mindful of lengths for dresses/skirts. You will not be wearing your regalia over your clothes as would be done at the Commencement ceremonies.